The Fun Factory commercial playground equipment from American Playground Company includes 13 activities in order to engross up to 45 children ages 2 to 12 years old. The Fun Factory will easily become the foundation and focal point of any public park or playground. Customize your playground with hundreds of different color combinations and options to create a brightly colored primary theme or one that blends well with the landscape and natural environment. 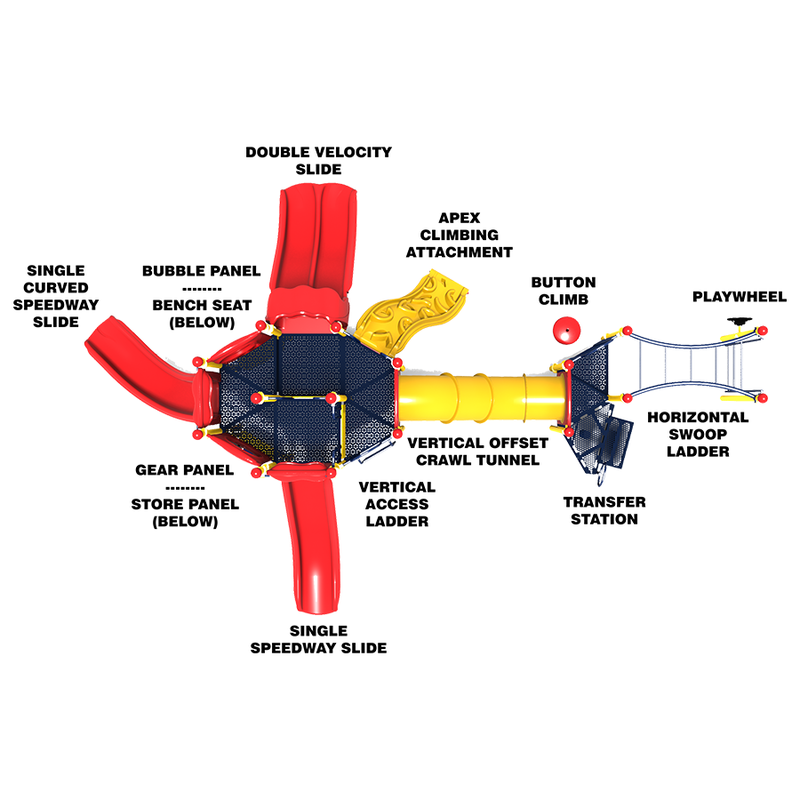 A Double Velocity Slide that allows kids to race to the bottom side-by-side. A Cuved Speedway Slide for a different yet classic slide experience. A Single Speedway Slide at the top most deck height for a fast trip to the bottom. An Apex Climbing Attachment that is designed with hand and foot holds for smaller age groups, and also features a trackfor matchbox sized cars down the side. A Horizontal Swoop Ladder overhead climber to develop upper body strength. An interactive Gear Panel that demonstrates cause and effect mechanical relationships. A vertical offset Crawl Tunnel provides a unique means of ingress to the play decks. 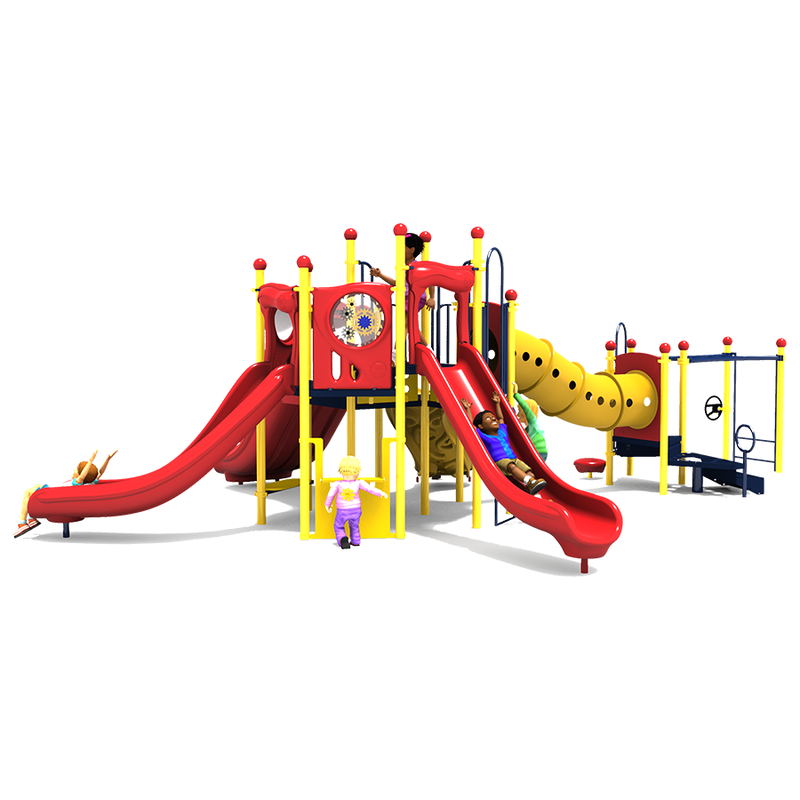 A Bubble Panel, Store Panel, and Playwheel provide imaginative play opportunities in groups or individually. A below deck Bench Seat for encouraging social interaction or for a relaxing place to rest. A Button Step to improve balance. A Vertical Access Ladder for a straight-forward means of accessing the play decks, but which also strengthens leg muscles. The structure is constructed from lead-free polyethylene coated punched steel decks, 3.5in. outside diameter galvanized 12 gauge steel posts, UV stabilized roto-molded plastic components, and high-density polyethylene activity panels. Steel posts are powder-coated to customer color specifications, and are backed by a Lifetime Limited Warranty. All plastic components and decks come with a 15 year limited warranty. The metal pipes, rungs, loops, and rails associated with climbers come backed by a 50 year limited warranty. Trust the playground experts at American Playground Company to help select the right commercial playground equipment and amenities you need to design your perfect park. 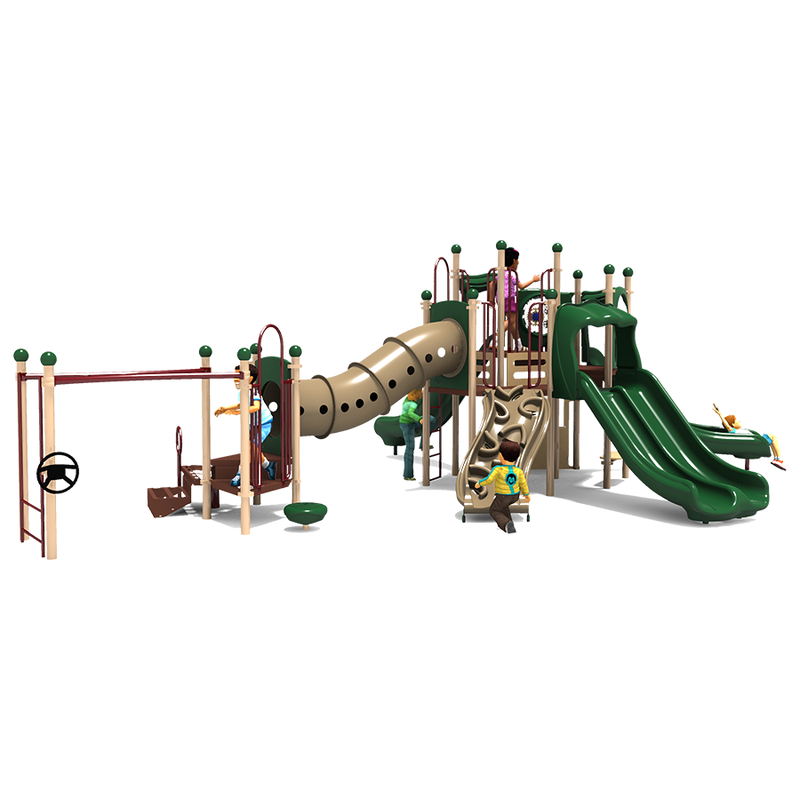 We are a leading provider and installer of professional playgrounds. 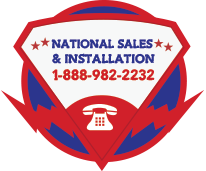 Call us at 1-888-982-2232 to get started on your project.